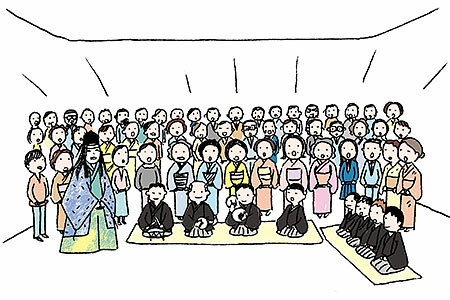 TRIVIA of Noh : Q143 : A Noh version of the Ninth Symphony? | Home | Trivia | Q143 : A Noh version of the Ninth Symphony? A Noh version of the Ninth Symphony? Around 200 people practice chanting “Takasago” three times a month from October until the performance at the end of December. The event attracts a wide range of participants, from elementary school children to people in their eighties, including many beginners at chanting. Professional Noh performers train them six times in small groups and three times all together. Since the opportunity is a rare one, some join the rehearsals from far away. Among the reasons for the popularity of the event is that the participants will be able to chant “Takasago,” with good posture and vocal performance, as well as learn gracious etiquette and interact with people of all ages. “Takasago” is a joyous play featuring chants to longevity, conjugal love, and peace and tranquillity for the country. The close of the year may be a perfect time to chant the piece and connect with Japanese culture.